The Analogue Dragon is Pam’s “pop-up” or mobile media arts studio. With it, she shares her passion historic media arts processes with the community. The studio features street portraits made with vintage and handmade cameras and traditional black and white darkroom materials and processes. Pam also creates letterpress prints using an antique platen press and wood and lead type. 2017 was the Analogue Dragon’s first year. 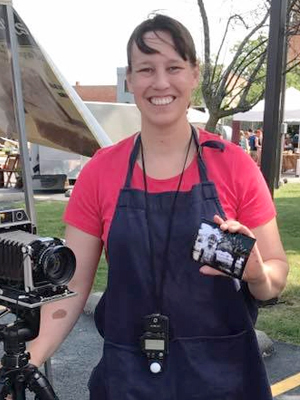 Using a portable darkroom and vintage film camera, Pam created black and white street portraits for people at the Hillsdale County Farmers’ Market. Pamela is a photographic artist and educator specializing in historic photographic and letterpress printmaking processes. She has worked as a professional portrait photographer since 1998. Pam is also an instructor of photography for the Art Institute of Pittsburgh’s Online Division serving as adjunct faculty since 2007. Pam holds a B.A. in Art from Hillsdale College (1998). She also earned an M.F.A. in Photography (2005) and an M.A. in Arts Administration (2013) both from the Savannah College of Art & Design. Visit my Etsy shop to find more cool stuff!